Blackbird alarm calls got me up and out into the garden, I knew there was a nest in my Holly tree. With the weather being so poor earlier on this year I never managed to give the tree a good pruning, a painful process (for me that is), the leaves are very sharp. The cause of the alarm calls were my two cats who were mooching around the tree looking for somewhere out of the sun to settle down for a sleep. So now I’m fretting for the well being of the Blackbird chicks. I’ve talked to the the cats about them but they weren’t impressed. My old Tomcat (Orlando) never bothered about birds too much, but the girls are fascinated by them. Later on I decided to do a bit more sorting out of the spare bedroom/ex darkroom and came across a box of prints I had forgotten about. They are all from infrared film, and were very tricky to print, but scanned in well. The ones above were taken on the way to Barmouth and Portmeirion. These were all taken on Kodak HIE infrared on my Olympus OM2n. This was taken on Konica IR750 film on my Rolleiflex in 1993. Rundale Palace has been beautifully restored now. This entry was posted in Analogue Photography, Black & White, Film Photography, Latvia, North Wales, Olympus OM2N, Rolleiflex, Yorkshire and tagged Architecture, Infrared, Old Photographs, Photography, Travel, Trees on May 25, 2017 by conspicari. I took this photo in 1992 on Konica IR750 infrared film. 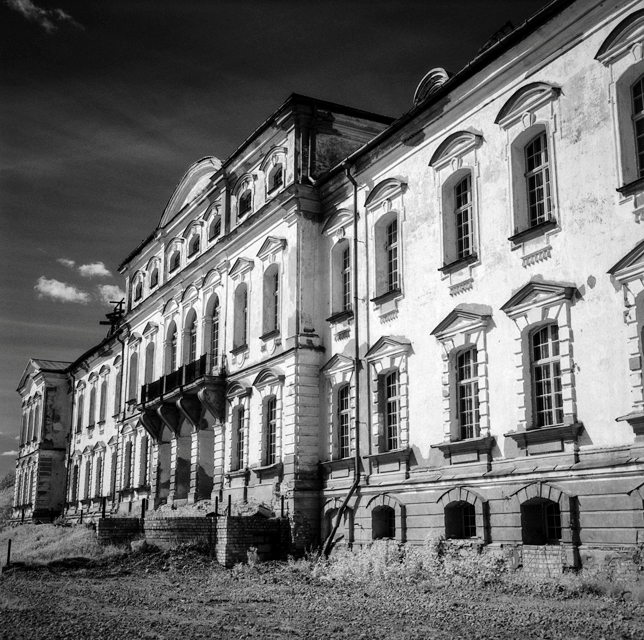 This was before the Rundale Palace had been restored. It looks fantastic nowadays but somehow I prefered it as it was in 1992. The Rollei lens is very sharp and I really must use it again. This entry was posted in Architecture, Black & White, Film Photography, Latvia, Rolleiflex and tagged Black & White Film, Infrared on November 8, 2015 by conspicari.